Germany Tightens Up as PokerStars Weasles In? Good matchups, but does it signify anything more? 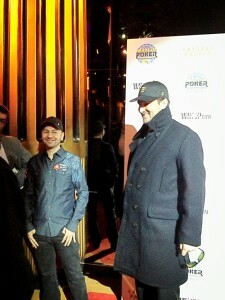 Daniel Negreanu and Phil Hellmuth arrive for the NBC Heads-Up draw party, even though Negreanu opted out to spend the weekend with friends. NBC’s $25,000 buy-in National Heads-Up Poker Championship invitational tournament is decidedly made-for-television . The draw party Wednesday night felt like little more than a chance to hobnob with the who’s who of televised poker and online wunderkinds, from Brunson to Hellmuth to Jungleman and ZeeJustin. But after a Black Friday-induced hiatus, some in the poker world say the return of the event to the Caesars Palace poker room signals a step forward for poker in the U.S.
Caesars Entertainment Interactive, which recently acquired a license to operate online poker in Nevada, presented its wsop.com as part of the event for the first time since the tournament began in 2005. Mori Eskandani, the producer of the show, called it ‘good news’ for the industry that NBC wants poker back. The matches start Thursday afternoon, and they’ll crown a champion on Saturday. This year, Phil Hellmuth, who arrived to the party Wednesday night in his dictator coat, squares off against Mike Sexton in round one. Daniel Negreanu, meanwhile, has opted out to spend the weekend with friends. That made room for David “Doc” Sands, who put up something of a fit after he didn’t get a direct invite. Anyway, here’s how the bracket shapes up for the first round. First place is $750,000. Anyone else got Jennifer Tilly going all the way?